When most of us hear the phrase “education lottery” we think of Georgia's HOPE scholarship program. It's been wildly successful and has made it possible for thousands kids to attend college – many of whom wouldn't have had the chance otherwise. Or has it? Academic studies and statistics show that merit-based scholarships fund the educations of students who would have attended college anyway – mostly white, middle and upper-middle class students. Imagine someone reacting to higher education's current situation by saying that what we needed were large new programs to subsidize white and middle- to upper-income students to attend college, and that it was not necessary to raise need-based aid even enough to cover new tuition increases. We would give some minority students entering awards because of their relatively high grade point averages from inferior segregated schools. However, we will take their aid away when they cannot get a “B” average in a vastly more competitive college setting and blame them for not being up to the task. A huge amount of money would go into this new program, far more than was spent for the need-based scholarships in some states. We would get the money from an extremely regressive tax-a state lottery that drew money disproportionately from poor and minority players. In other words, poor blacks and Latinos would end up paying a substantial part of the cost of educating more affluent white students, who would have gone to college even if they had not had the additional financial incentive. Assuming that two children are identical in every way, including high school grade point averages and SAT scores, if one child resides in a household where the parents’ income is $25,000 and the other resides in a household where the parents’ income is $50,000. The child in the $50,000 household will complete 80% more schooling than the child in the $25,000 household. On the flip, we'll look at the actual statistics of how education scholarship lotteries affected college attendance in Florida, Georgia, and Tennessee – and talk about how Tennessee structured its program to benefit more low-income students. It's a model worth considering in Alabama. Just coming in on our lottery series? Catch up with Part 1, Part 2, and Part 3. They took these findings (and other numbers too) and used the data to estimate the present and future value of a “lottery tax” on residents. 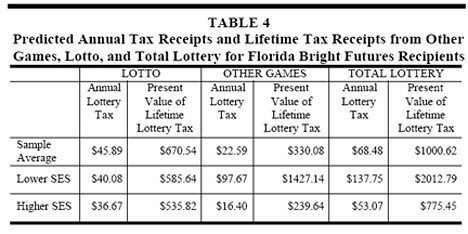 What they call a lottery tax is actually the household's estimated annual expenditures on lottery games. The authors note dryly: “In other words, Lotto seems to be the lesser of two evils from a public finance standpoint” because the “burden” of the Lotto game falls heavier on higher income households. Once again, the typical households represent the sample average, a lower SES household and a higher SES household. The sample average household has the mean value of each of the independent variables as its profile. The lower socioeconomic status (SES) household has a 48 year-old, African American, and single household head, rural residence, blue collar occupation, high school graduate, household size of three, and household income in the lowest category. The high SES household has a 48 year-old, Caucasian and married household head, suburban residence, professional occupation for the male household head, female head stays at home, both household heads are college graduates, household size of four, and household income in the highest category. The high SES household has a 42% probability of receiving the 100% scholarship. In contrast, the low SES household has only a 10% probability of receiving the 100% scholarship. 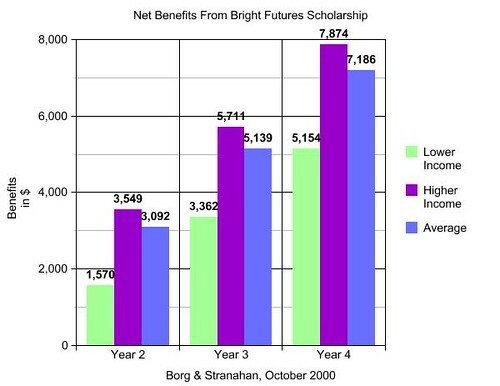 How can almost all of the households with children who receive the Bright Futures Scholarship receive more monetary benefit from the scholarship program than they pay in lifetime lottery taxes? The answer is obvious: the difference is made up by the lottery taxes paid by other households who will never receive an FBF scholarship. Those other households contain the bulk of lottery players who tend to be less-educated, lower income and non-white. 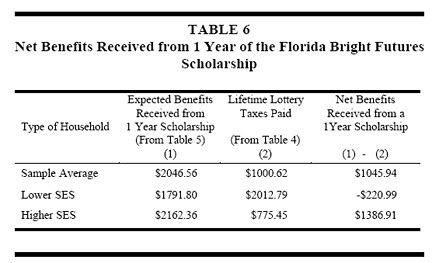 Essentially, the Florida Bright Futures Scholarship Program and other lottery-funded merit scholarship programs like it, are tantamount to an income redistribution program from non-white, low-income, uneducated households to white, rich, well-educated households. Is it the same in Georgia? Pretty much. In its first year, the program spent $21 million helping about 43,000 students. By 2009, its costs had soared to $639 million to cover college expenses for 248,000 students. If the sheer growth weren’t enough, program costs have increased at double-digit rates, while lottery proceeds have been flat. Georgia's HOPE scholarships used to have family income caps, but those were removed when the program was flush with cash (learn more about this in Tuesday's blog post). Now the program is struggling to pay promised benefits, but benefits are devilishly hard to take away – especially if the recipients are well-heeled parents protecting their kids' college educations. In the years before HOPE, white students were 11% more likely to attend college than African American students (page 5). Since HOPE, that percentage has increased to 26% more likely. Furthermore, the 20 ZIP codes with the most lottery winners had annual family incomes below the state's median – which mirrors studies that show low income people tend to play the lottery more. Meanwhile, the 20 counties with the most HOPE recipients had incomes 72% higher than the other counties. Students who receive the maximum Pell Grants are not eligible for HOPE scholarships, but can receive a yearly book allowance of $150 per semester – a benefit the legislature is considering removing because of the program's financial troubles. Are the HOPE Scholarships and Grants the best way to genuinely advance public education – or would Georgia’s children derive a far greater benefit if the same dollars were used to make high quality pre-k available to all 3 and 4 year olds? Georgia is wasting hundreds of millions of dollars annually in lottery revenues to subsidize the tuition costs for middle and upper-income families who would have sent their children to college on their own expense, without a hand-out from the state. The HOPE scholarships don't seem encourage students to do well in college: 46% of recipients lose them the first year because they don't maintain a 3.0 GPA and more than 60% lose their scholarships at some point in their college career due to falling GPAs. Some legislators are asking if part of the HOPE scholarship money might be better spent preparing students for college instead of funneling students into colleges where they may not be prepared to perform adequately. Mindful of these facts, Tennessee was more careful in designing its program. There is merit-based aid but also need-based supplements. Tennessee’s HOPE program, created in 2002, was designed to mitigate that impact. Looked upon as a model program by some experts, it doles out awards on a sliding scale based on both merit and economic need. Students are given a base award of $4,000 if they have either a high school GPA of 3.0 or an ACT score of 19. Supplemental awards are available for students with even higher marks, or for students who come from households with incomes below a certain level. Tennessee also defines merit more broadly than West Virginia now does. Tennessee's eligibility criteria include one carefully chosen word: “or.” When legislators were laying out the plans for the scholarship, they found that giving HOPE to students with a 3.0 GPA “or” a 19 ACT score, instead of the more common GPA “and” ACT qualifications, doubled the percentage of projected eligible students who were African-American. While Tennessee has worked harder than other states to address problems of income and racial disparities, the program isn't immune (21 page PDF) from problems. In the Fall of 2004, median family income of lottery scholarship recipients was $69,272. Median family income of non-lottery recipients was $56,000. Researchers have found that students already in school when they receive the Tennessee scholarships are far more likely to obtain degrees than new students. Although every college experiences Freshman dropout rates higher than other students, the rates seem even higher for students on lottery scholarships – particularly those from low income households. Some programs require full-time student status to receive the scholarship and/or enter college immediately after high school. This could impact low income students more adversely because the scholarships only pay tuition (some also pay a percentage of fees): the students still have to live somewhere, eat, buy books, etc. and full time status hampers students' ability to work at the same time. These are also students who may be farther behind academically as they can't devote as much time to studying. And, of course, some scholarship students may simply be ill-prepared for college and there are ways to address that problem. But none are cheap and none are easy. Tomorrow, in our final installment, we'll discuss ways that Alabama can learn from these other states when it starts designing a state education lottery. 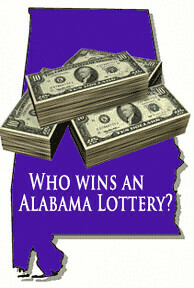 “Welfare for the rich.” Some of the lotteries you describe are acting to transfer wealth — the pitiful little wealth there is — from the poorest, least educated, communities of color to well off, white kids who could very almost certainly go to college without assistance from “the least of these.” Alabama must make sure this system is not replicated here. Another thing that distresses me is the observation that scholarship recipients are more likely to drop out than the average student. If the child drops out, especially the first year, it's like tossing that money down a rat hole. This is unforgivable, considering where it comes from. As I understand it, it is a fairly long running observation that the Georgia lottery transfers income upward. Here's a statistic to keep in mind about Alabama before you decide to hand out scholarships: the state's schools only prepare 28% of students for college. [Your “insert link” popup wasn't cooperating.] If Alabama is only preparing roughly 1/4 of students for college then what is the point of giving many of those kids scholarships? They will end up like the large chunk of Georgia students that ultimately lose them. One other comment probably better suited for the post discussing marketing, but the best concise description of a lottery I've ever heard is that it is a tax on stupidity. The dumb don't fully appreciate the long odds and probably have crappy, low income jobs (because they're stupid) and spend way too much on lotto games. Anyway, did you know that in some states they keep selling particular scratch off games even after all of the top prizes have been claimed? The poor morons buying the tickets don't even realize they have no chance of hitting the jackpot. When the lotto commission is pricing the game they know exactly how much they have to give out in total prizes and how much revenue they will receive (number of tickets x cost per ticket). If the jackpot tickets are sold early they can't stop selling tickets because they would lose money. So instead they just keep right on selling tickets even though no one can win big. As a glimpse at a response post I'll write after you complete this excellent series, “education” lotteries create conflicting interests. On one hand the state is charged with educating pupils. Teaching them the three R's (as the old saying goes). On the other hand the state is compelled to actively and aggressively market a game that requires stupid people to be successful. If the state is too successful in educating children (teaching them about math and probability) then their lotto sales decline. That is one reason they love scholarships. Relatively few will qualify and use them, which leaves a large chunk of the population sufficiently stupid to spend a sizable chunk of their paychecks on scratchers.